Our Ladies. 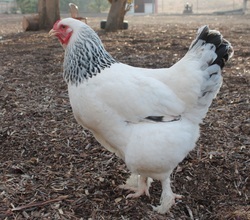 Please see our Roosters as well. Country of origin of breed listed in some places. Great project for students to research what countries breeds came from & how they were developed. Adopted at 10 mos old in March 2013 from a family who couldn't keep her because of her noise level. Her birth month is May 2012. 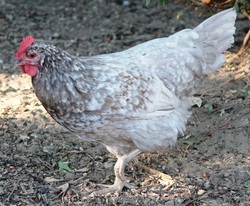 She is a stately girl and very consistent in her egg production. She laid an egg in the carrier in the car on her way home from being adopted. 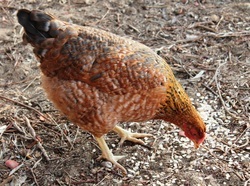 Very friendly & holds her own against the roosters. Does make a ruckus in the morning, louder than some of the roosters. Also adopted from the same family as they were raised together so they were adopted together. 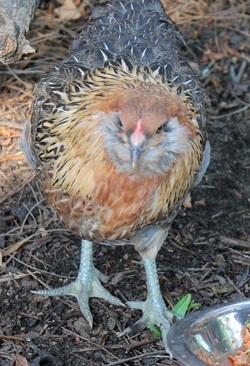 Very broody, she lives to sit on everyone else's eggs. She has hatched out eggs for us twice. Doesn't seem to hang out with the other chickens, lower on the pecking order. 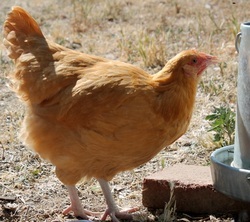 Mo tends to hang out in the coop waiting for eggs & comes out to eat & drink for a while. Can be very loud, too. 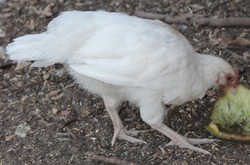 Born May 2012. Adopted at 3 mos old in February 2013, birth month November 2012. Lays a light green egg. Neither friendly nor unfriendly. Fine being held but doesn't seek out people for interaction other than treats. Consistent layer. Named after the Aunt Ruth of Veggie Tales fame that *has a beard*. Dominant one of the three Easter Eggers, worried for a while she was a rooster. Enjoys treats & sitting in trees. The muffless Easter Egger. 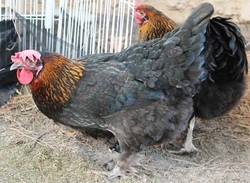 All three were adopted at the same time from the same family, they have all been great girls as far as consistent egg laying. 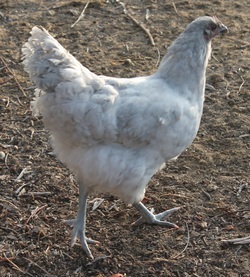 Also adopted at 3 mos from the same family as the Easter Eggers. 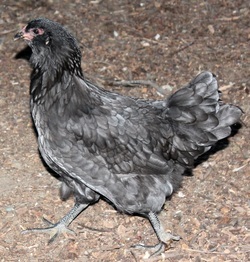 She was hatched & raised by their broody silkie. 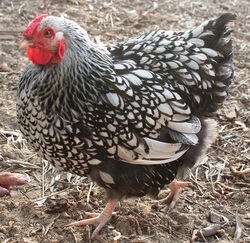 Friendly when caught, doesn't seek out people but blends well with the flock & pretty to look at. Lays well, light brown egg 4-5 days a week. Adopted at 2 mos old from Dare 2 Dream Farms, April 2013. 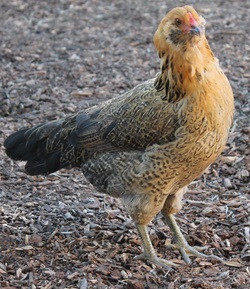 A bit bossy to other chickens, friendly with people, lays well. Gets picked on by the roosters. Also adopted at 2 mos old from Dare 2 Dream Farms, April 2013. 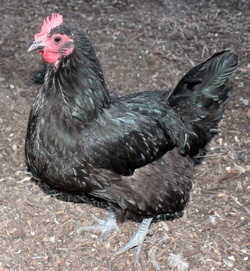 Blends in with the flock, lays eggs consistently. Friendly when held. 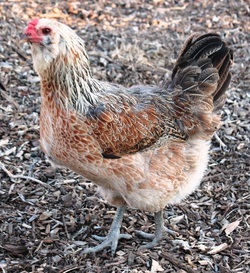 This breed is known as being an all around chicken. Cold & heat hardy, friendly & good consistent layers. 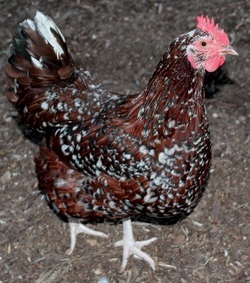 They come in such a wide variety of colors & a whole flock of these would still look very different. Our girl is friendly but doesn't seek out human companionship. Sussexes are known to be busybodies, social chickens. Rachel is named after "Rachel Lynde" of Anne of Green Gables fame as the gossipy nosy neighbor. Our Rachel follows me around trying to get into everything I am doing & looking for treats. Consisten layer of light brown eggs. 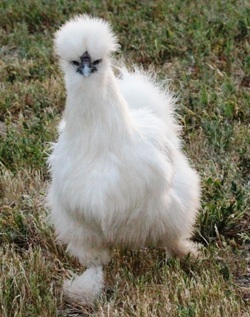 This is the hands down sweetest chicken ever. Totally quite, never makes a sound. Consisten layer of small eggs 4-5 days a week. Everyone should have some bantam cochins! 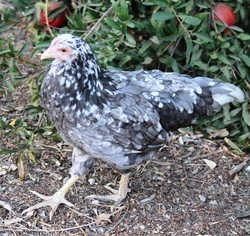 We got Victoria as a free ranch mix bonus with purchase from Anderson Garden Chickens. She is beautiful, friendly, and a good layer. 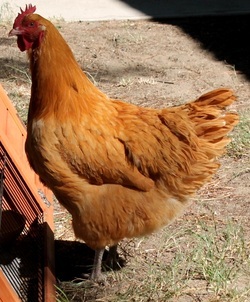 She is the mother of our rooster, Lemon Pop. Her floppy comb is humorous to watch as she moves. 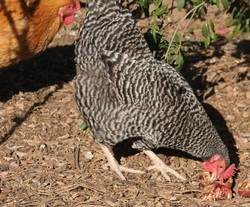 She lays us beautiful chocolate brown eggs almost every day. Very easy going girl. 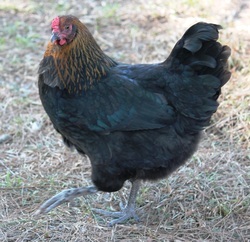 Polite & non-assuming, we are looking forward to her laying and hoping she has a longer life than our other three orpingtons who did not make it a year. 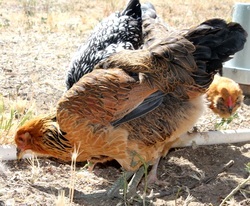 Mopsy is the mom & Sven is the dad on this ranch mix chick. Born November 29, 2013. Picture taken February 3, 2014 at 10 weeks. She flew over the fence & was the first victim of the dogs. She was a sweet girl. They are known for being flighty but my daughter fell in love with her so we took a chance. 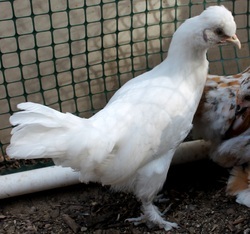 Andalusians lay white eggs. 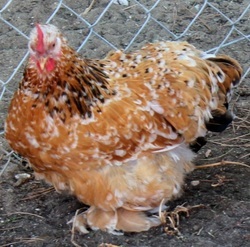 Ours had not yet started laying. July 2013-Second victim of the dogs, she also flew over the fence to her fate at 4 months old. 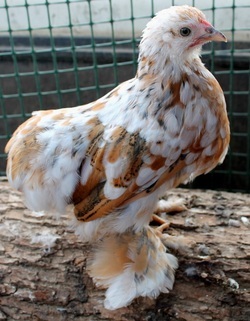 Victim of Avian Pox. She had it worse than any of the other chickens. Incredibly sweet, friendly chicken. She died in roost. She had just been on the roost bar in the morning & by afternoon she was gone. 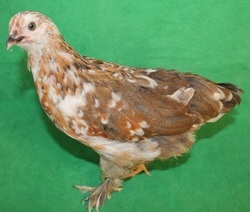 She did not show signs of avian pox, maybe she was eggbound. 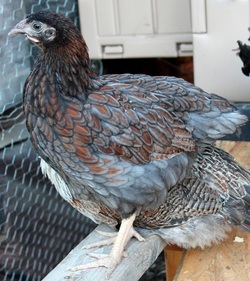 She was raised by a broody silkie & was not as friendly as her same age/breed counterpart. Hard to catch until she started laying. 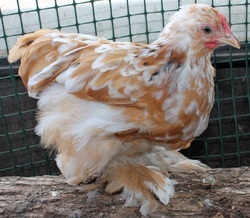 She was one of our first two eggs hatched with our broody silkie with fertile SFH eggs we bought. We found out that a raccoon lives in our housing tract the hard way. The raccoon took her out of the coop during the night when she was 5 months old. She flew over the fence & the dogs got her . 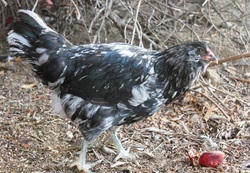 She was a great layer & gave us 5 eggs a week, beautiful olive color. Our rooster, Lemon Pop, is from one of her eggs.